Allows sewer gases to escape outside through a vent stack, preferably above the roof. likely to happen if a filled sink or tub is drained. The vent breaks the siphon effect, keeping water in the trap. See examples of BAD TRAPS. main stack and do require a separate vent, the vent must extend above every other fixture in the house. At this point it may join the main stack. It is, therefore, possible for a house to have several bathrooms, and only one vent stack going up through the roof. plumbing installed at the exterior of the house. 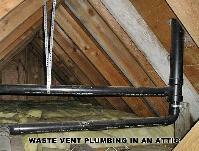 weather, a vent in an attic can add moist warm air into a cold attic resulting in condensation and frost damage. The vent should extend only about twelve inches above the roof line. Vents which are very long may be subject to frost closure in the winter. diameter where they penetrate the roof system in order to avoid frost closure. boiled water down the vent from the top. is expensive to break into walls and ceilings to add proper venting. installed higher than the drain in an accessible and ventilated area.